For the first time of the 2015 season the New York Mets were swept. The Mets lost 4 games to the Chicago Cubs at Wrigley Field something that hadn’t happened since 1992. One of the main issues that the Mets had during the series was their offensive lineup. The Mets have scored (3) or fewer runs this past week. The second game of the four game series marked the debut of Noah Syndergaard. Syndergaard did not get any run support in his first game, going into the 6th inning Noah got himself in a jam which caused him to give up 4 runs in the inning. That forced Terry Collins to pull him from the game. The Mets didn’t score their first run until the 8th inning, which was a sacrifice fly by Kevin Plawecki which drove in Lucas Duda. That run turned out to be the only run for the Mets that game, which spoiled Syndergaard’s solid debut which turned into a loss. 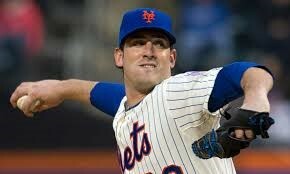 After a strong (7) inning performance by the “Dark Knight” Matt Harvey, the Mets offense could not come together for the second straight night in a row; only scoring (1) run which came in the (6th) inning. The Mets brought in Jeurys Familia who pitched (0.1) innings, and then they went to Carlos Torres who did not have an outing he would like to forget about. Torres in his (1) inning of work gave up (2) runs, which turned out to be the game tying and game winning runs for the Cubs. For the first time in the 4 game series the Mets scored (5) runs in the series finale. The Mets sent out Jonathan Niese to the mound, he had a (5-1) lead going into the (5th) inning, which he blew giving up (4) runs in the bottom of the (5th) inning. Niese pitched (6.1) innings. In his outing he gave up (6) runs. The Mets bullpen gave the team a chance to come back and possibly win the game. Collins brought in Hansel Robles, Jack Leathersich, and Erik Goeddel; and none of the relievers gave up a single run but the offense couldn’t scratch out a couple more runs to give the team the lead. This concluded the (4) game series. This was a historic win for Cubs Manager Joe Maddon as it marked his 800th career win. It was a rough week in Chicago for the Mets, but they will head back to Queens and will have a matchup with the Milwaukee Brewers starting on Friday May15th. This will mark the first game of a seven game home stand. Sunday May 17th will mark the Citi Field debut for Noah Syndergaard which will be against the Milwaukee Brewers and will share the mound with Wily Peralta. Brandon Glogau is a current student at Long Island University majoring in Journalism and minoring in Sports Managment.